Did you enjoy the first issue of Unruly PaperArts (UPA)? Wow, so much inspiration from the Columnists and guests and fabulous entries from the readers too. It's my turn this month to contribute. A sample for the Reader's Art Quest (RAQ) today and my very first column coming later in the month. My focus for the RAQ is anything but a card (but could fit in with the lace theme too LOL), and is for the 'Wedding Wonders' overall theme. I chose to re-cycle a small jar and make a small table light which could be used anywhere for decoration on the big day. I forgot to take a photo before I started but here is the jar after the first couple of layers. 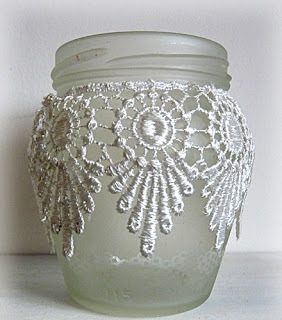 Firstly I used paper lace on the jar as a mask and sprayed it with glass frosting. 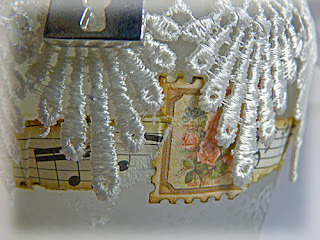 I added lace, vintage paper and little stamps (from the G45 Romantique pad). The lid was sprayed with antique white paint and when dry I added more vintage paper, cut out part of a Cheery Lyn doily and added some little embellishments, the ribbon rose and paper and lace horn were hand made. Jewellery comes in really useful for adding some sparkle. 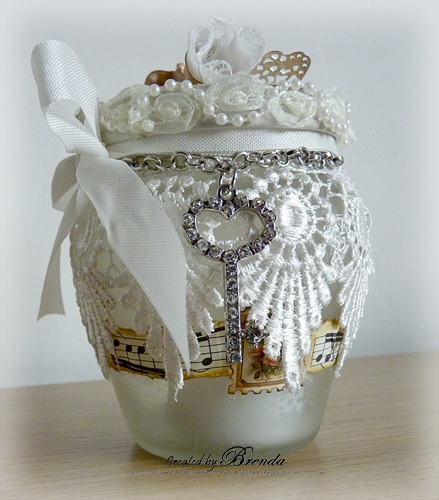 I completed the jar by adding keys and a lock on chain, ribbon and pearl-twisted ribbon to complete the wedding look. We hope you are enjoying the new Blogozine and are able to dip into the articles for some fabulous inspiration from the team. There are two RAQs every month and the FAQ section will answer all your questions about what and how you can enter. I do so hope to see you over there with your wedding wonders this month. The last dates for adding are clearly laid out on the blog. Just look for the labels under the blog header to find where you submit your piece. I am hoping to see you over on the blog, let us know what you have enjoyed so far. Have fun creating and making this month. A wonderful altered jar, so romantic and perfect for a wedding decoration. This is really beautiful Brenda!! wow what a stunning jar, very beautiful! Love this! What a wonderful keepsake for a wedding. Very lovely. This absolutely gorgeous Brenda. And what a lovely idea. WOW! Brenda This is absolutely gorgeous, love everything about it. 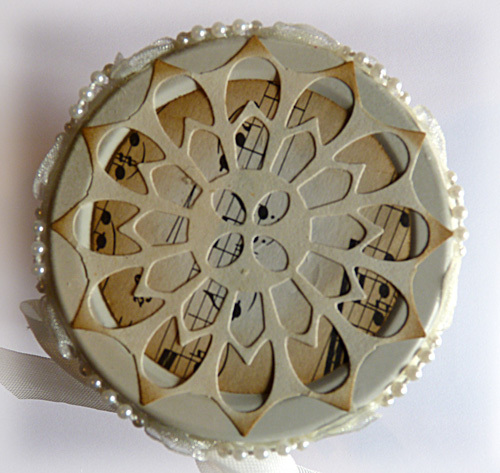 Stunning alteration, its a real beautiful project. Hi Brenda, this is sooo beautiful. What a great idea for a table piece. So very feminime and so many interesting elements. Beautiful. Luv, luv, luv your jar Brenda. Don't know anything about the magazine you have mentioned so will pop over to the blog and see what its all about. This is gorgeous, and so perfect and original for a wedding table centrepiece! Love it! I have never tried that glass frosting but it looks very appealing? Looks like you were very busy yesterday, hee hee! Brenda, this is amazing. I love it !!!! 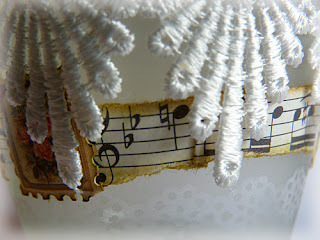 This is gorgeous right on down to the smallest detail, you did not leave anything out! The frosted glass adds such a rich feel! 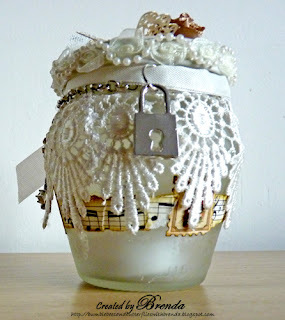 Beautiful atered jar and perfect for a wedding theme! More hugs! 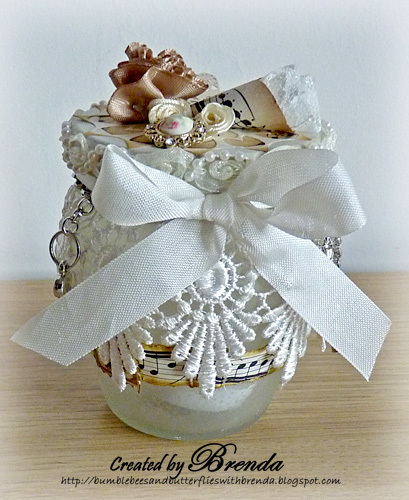 I have to say I am really loving your jar, it is so elegant and would make a stunning gift. You've created that jar so beautifully Brenda! It's just as if you wave a magic wand and say Oojie Poojie or something and it appears like magic. I do so admire all your creative work my dear. 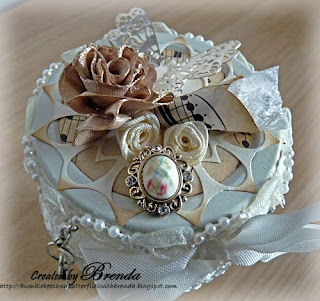 Exquisitely crafted, dear Brenda! So beautiful. 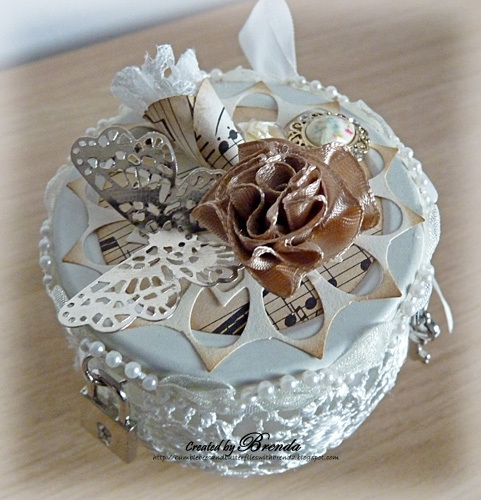 Catching up here Brenda and your altered jar is a vintage looking stunner. Love all the beautiful embellishing. hi Brenda, this is one amazing jar !!! Stunning beautiful and a real show stopper. So much gorgeous detail on this well done you.